The success of your website depends on the number of people who visit it. In order to increase the traffic, you will have to spend a fair amount of money in SEO and other website marketing activities. You may feel that you do not have a large amount of money to generate traffic. However, there are a few methods that you can use that are completely free of cost. Google is a great source for getting targeted traffic for all businesses. All you need is a bit of SEO and you will be able to attain a fair amount of traffic. Of course, the keywords will matter. If they are not very competitive, then the process is going to be easy. However, competitive keywords will require more effort in the form of content and social network strategies. Content is important. 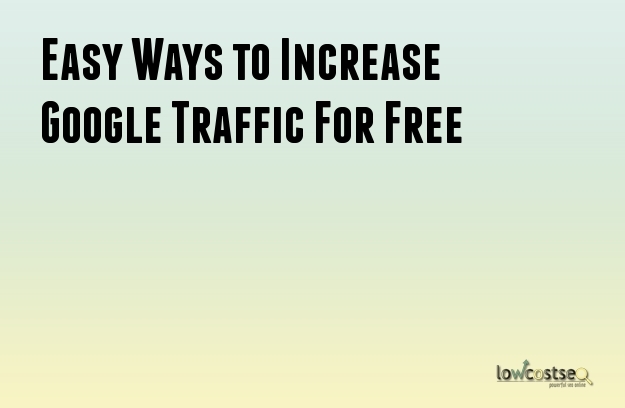 Without it, you will never be able to gain a good amount of traffic. You should provide content that is useful, relevant and unique. The content should be provided on a relearn basis. Take the tastes of your customers into consideration while creating the content. Google Plus can be invaluable when you are trying to attract traffic through Google. Create authorships in Google Plus which can increase the click rates when people search in Google. Share your content on Google Plus and ensure that it is public. That will make the content appear in the search results of Google. Without proper optimization it can become difficult for your content to appear in search results. Feel free to incorporate a few keywords in your headings. However, avoid doing it too much. Highlight the important phrases and words. You can make them bold, underlined, italic or in different colors. The title tag and meta-description should be relevant and unique. Try to keep URLs of your webpages short, concise and simple. Add some images to the content and use the ALT attribute. This will make the search engine bots read the images accurately. Internal linking can be valuable if done properly. The anchor text of the content should be descriptive. Do not forget to proofread the content before posting. Nobody likes a website that performs poorly, not even Google. Moreover, Google can penalize websites with poor performance. Decrease the loading times required by your website. Opt for a web design that is responsive. Check if your website contains broken links and remove them at the earliest. 404 pages are unavoidable but they need to be useless. Try to make them useful. Backlinks are essential to gaining the best spots in Google search rankings. Become a guest author for blogs in credible websites. Develop your social media profiles and create a strong presence on those networks.